An extraordinary guitar in recognition of an extraordinary musician. Every single thing: build, finish, presentation and awesome sound. Coming to terms with the fact that we'll probably never own one. Since 1931, Martin Guitars of Nazareth, Pennsylvania has been building guitars that bear the name of an artist. Be it Gene Autry, Johnny Cash or Paul Simon, artist models are an important and ongoing part of the Martin story. For the most part however, the privileged few bestowed with the honour of a Martin Guitar in their name have been American artists, many of whom have been comparatively lesser known on UK shores. In 2007, Westside Distribution began an ambitious programme to redress the balance somewhat. Plans for a special series of guitars released in honour of British Martin-playing artists were hatched, and with Martin Guitars' full backing and endorsement, Westside began drawing up a select list of names and making approaches. As a result, April 2007 saw the release of the Rory Gallagher dreadnought while a few months later the Davey Graham OM model was released. Westside is at pains to stress that the UK Artist guitars are not signature models or an attempt to faithfully recreate the artists' favoured model. Rather they are commemorative editions released to celebrate British artists whose impact on the musical landscape of this country is undeniable. The third in this exclusive series is the John Martyn model. The Martin John Martyn UK artist model is based primarily on a D-28; for many, the benchmark by which all dreadnoughts should be judged. However, as a result of the collaboration between Westside and the artist, the John Martyn model features some interesting and exciting variations to the standard D-28. 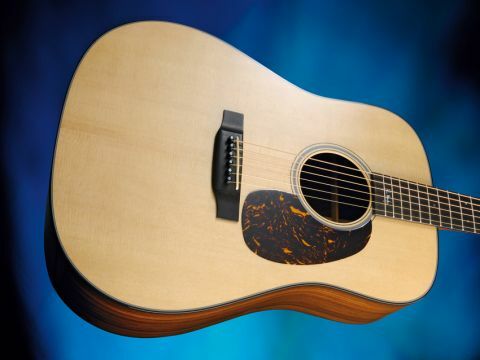 "Simply put, the John Martyn D-28 is the finest dreadnought this reviewer has ever played." A high-quality selection of Sitka spruce has been used for the top, while the sides and two-piece back are East Indian rosewood - a wood that's fast becoming the preferred alternative to the depleting stocks of Brazilian rosewood. The panels to both the guitar's soundboard and back are beautifully book-matched. The decorative centre strip to the back is a flawless and tasteful example of parquetry, while black coloured boltaron - a PVC plastic used by Martin since the late sixties due to its anti-discolouring properties - has been used for the binding as well as the heelcap and tapered end-piece. White boltaron, meanwhile, is chosen for the side dot markers. The purfling is standard D-28 style. A bevel-edged, partially transparent tortoiseshell pickguard sits around the classic, style-18 soundhole rosette while a bone compensated saddle sits snugly within the black ebony bridge. Abalone pearl dots top the black bridge pins and black ebony has also been used for the headplate. The mahogany, satin finished, low-profile neck employs a beautifully executed dovetail joint. A simple, yet ultra-stylish old-style C F Martin decal adorns the headstock along with side-mounted Waverly 4063 tuners. As stated earlier, from a structural point of view, this is not a 'regular' Martin D-28. The neck dimensions and choice of headstock were influenced by Martins within John Martyn's own collection. In discussions with Westside, Martyn requested a wider fingerboard than that of a regular dreadnought (1 11/16ths-inch) and expressed a preference for one with the same dimensions as a 000-shape Martin he owned (1 3/4-inch). A slotted headstock was also agreed upon in recognition of a rare '0' shape from the very early 1900s. The John Martyn D-28 possesses components of the three Martins owned by the man himself. One of the most endearing decorations to this D-28 is the inclusion of what Westside refer to as the 'Orb' at the 5th fret. Anyone familiar with Martyn's music will immediately recognise it from the front cover of the 1973 album Solid Air. This thoughtful but subtle feature, along with the wider fingerboard and slotted headstock, totally personalises the instrument and gives it a wonderful sense of character. The workmanship and design that have gone into this model are second to none and its presentation, even under close scrutiny, is as good as you'll see anywhere. Without getting into subjective issues such as using Brazilian rosewood or super exotic inlay, it's hard to see how this guitar could be improved. If the guitar itself is mightily impressive, it is nothing compared to the remarkable tone that gushes out from the heart of this extraordinary instrument. In terms of its dynamics, the John Martyn D-28 has three principle attributes: enormous sustain, ultra-sensitive responsiveness and hit-between-the-eyes clarity. When played in tandem with our house D-18 (a fine guitar in its own right), the John Martyn D-28 sings louder and longer. Paradoxically, conventional wisdom dictates that forward shifted bracing - which the D-28 has - detrimentally affects sustain, but not so here. This guitar plays as if the guys at Martin have installed a hidden sustain pedal. The definition of the full and balanced tone is noteworthy too. Whether strummed hard, delicately finger-picked or speedily flat-picked, the John Martyn D-28 has a pronounced, bell-like resonance and clarity right across the tonal spectrum. It somehow causes similar sized and expensive instruments to sound as if they're being played through a woollen blanket. The slotted headstock is no doubt a contributing factor to this as the added break angle of the strings over the nut drives the soundboard more than conventional block headstocks. But whatever the causes, it's a truly impressive guitar. Simply put, the John Martyn D-28 is the finest dreadnought this reviewer has ever played. Everything about it is just right and the longer we spent with it, the more it opened up and demonstrated that there's nothing it can't do. It is only the whopping price tag that causes a wince, but for those that can afford one, this limited edition will perform and reward in abundance. There was no one quite like John Martyn, and this unique and outstanding guitar is a fitting way to keep his memory alive.